I’ve been bullish on the future of the automotive industry for some time, but while visiting the 2018 Canadian International Autoshow last month, it occurred to me that the future of the car may be arriving faster than I ever expected. Now to be clear, I’m not referring to a specific brand, a specific model, or even a specific technology. What has changed is something more significant – consumer sentiment towards the industry. In days gone by, auto show visitors would crowd around the expensive sports cars or the concept cars that never had a hope of coming to market. These vehicles were the ones highlighted by manufacturers as the centrepiece of their displays, likely behind a rope or glass panel display. You didn’t have a hope of actually being able to sit in one, but they still captured your attention. This year, though, things have changed. The crowd simply wasn’t gathering around the Mercedes-AMG display. 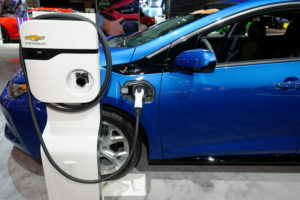 Instead, those attending this year’s show were captivated by technology – the basis underpinning autonomous, connected, electric and shared vehicles. The crowds around electric cars were not only bigger than other types of vehicles, but people were actually engaged on the issues and interested in learning more about the technology. I overheard a myriad of discussions around battery sizes, the difference in range between models, and the available tax incentives. Statistics will say that only 1% of vehicles on the road today are electric, but statistics don’t tell the whole story. When I say people at the auto show were interested in technology, I’m not referring to casual observers gawking at a high-end Tesla. What I overheard was high information shoppers looking at mass-market electric vehicles: the Nissan Leaf, the BMW i3, the Chevrolet Bolt and Chevrolet Volt. Electric vehicles may finally be on the cusp of going mainstream. There was a similar sentiment in the air when it came to autonomous and shared vehicles. No, there weren’t any true “self-driving” cars at the Toronto auto show, but one vehicle that saw significant interest was the Cadillac CT6 and its Super Cruise feature. Technology still isn’t at the point where a lawyer can spend their commute on a computer billing $500 an hour, but as far as semi-autonomous vehicles are concerned, it’s a game changer. Like other semi-autonomous driving systems, it can accelerate, brake, steer, and essentially drive the car without driver input. But where it stands apart is in Cadillac’s driver attention system. There are sensors on the top of the steering wheel column designed to track your gaze. If you are not paying attention to the road ahead, the vehicle will try to regain your attention before disengaging entirely. It’s a novel solution to the issue of drivers not paying attention while the technology continues to develop. The other feature unique to Cadillac’s implementation is it will only function on divided, limited access freeways that have previously been lidar-scanned and mapped by GM. This might be seen as a drawback compared to some other semi-autonomous systems on the market today which will operate on practically any road – like Tesla’s Autopilot feature – but it also provides one answer to the question of how self-driving cars will find their way around in suboptimal conditions. This means the vehicle is constantly comparing detailed high definition mapping data with real-life conditions, and adjusting accordingly. It’s not a stretch to imagine a future where vehicles are all connected to the cloud; these types of Lidar maps could be crowdsourced from thousands of vehicles and uploaded in real time, creating a reliable map backup for autonomous vehicles without requiring an auto manufacturer to actually map the entire continent themselves. Now think about what happens if we combine crowdsourced maps with the shared vehicle revolution. Just before the Toronto Autoshow, GM announced they would expand their car-sharing business Maven to Canada for the first time, with approximately 40 vehicles in the City of Toronto. GM is now the second vehicle manufacturer to offer their own carsharing service in Toronto, following in the footsteps of Car2Go – a service recently purchased by Daimler. Something big is happening in the auto industry, and auto show season provides us with a look at just how quickly technology is evolving. If the crowds I saw are anything to go by, consumer interest is evolving too.